Cities should delight and repel in equal measure. The most compelling urban environments have otherworldly properties; they agitate and encourage a sense of unease that reminds us that they present strange, unnatural ways of inhabiting this earth. Los Angeles is beautiful at dusk when this city’s singular, dirty air turns pink and drops across the low-rise buildings, leaving night in its place. But LA is also a grey, selfish and lonely tundra – a gothic metropolis, a sea of lost dreams, crime and smog. Berlin, Naples, Istanbul – all cities of wondrous, complex charm, but each with its own melancholic secrets. 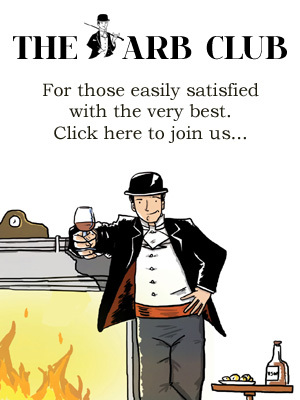 Sometimes it is an aura of loneliness, of urban disenchantment; sometimes it is the sour tang of rank inequality. There is always an edge. If anywhere is a paradigm of this complex, dichotomous structure of the city, it is Mumbai. Mumbai is a city that is as delicious and disgusting as the human mind could possibly imagine. I’ve travelled to some strange places, but none that could compete with old Bombay. The first thing we see from the air as we make our descent to Mumbai’s International Airport is the heavy smog – it’s May, and extremely hot and wet – the monsoon will be on its way soon and this has led to a thick, oppressive, warm fog that has engulfed the city’s seemingly endless skyscrapers and added to the city’s already otherworldly feel. The humid, alien air hits us as we leave the terminal and remains alongside us for the duration of our trip in India. Clichés abound, but the smells of this city are indescribably intense and multifarious. There is something vegetal, something animal, something perfumed, and something industrial wherever you turn. There is an overwhelming tension between progress and decay and these irreconcilable qualities make Mumbai the thrilling conundrum it is. 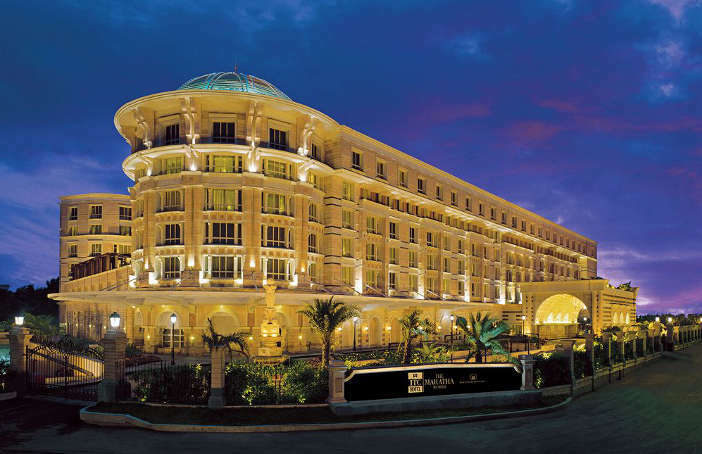 We are staying in glowing, magnificent luxury at the ITC Maratha – one of Mumbai’s grandest and most impressive hotels. ITC is a huge, listed Indian conglomerate with interests everywhere; hotels are a fairly small string in their bow, but the hotels they have are wondrous. There are several other ITC hotels across the city, but the Maratha is very well placed for the airport, and (vitally) boasts three of Mumbai’s finest restaurants. From the outside the hotel has a fairly sturdy sense of purpose and solidity; the huge sandstone structure resembles a fort. Once through the hotel’s glass doors and into the marble-lined atrium and you enter a very different sphere. The welcome is warm and reassuringly official, then we are then led up to our room, which is on the 15th floor. Where the hotel looks stolid and somewhat impenetrable from the outside, inside, ITC Maratha is triumphantly beautiful. The design centres around a large central atrium, where much enjoyment can be found at meal times. This dining/meeting room has the feel of being outside, with palm trees and space and an extraordinarily high, glass ceiling. The rooms of the hotel then fan out around this central space, set out across long corridors that ascend toward the roof. Our room is spacious and stylish. The design melds tradition and modernity, with crisp contemporary features set against ancient prints and antique artefacts. There is a massage chair in one corner; we happily settle in. 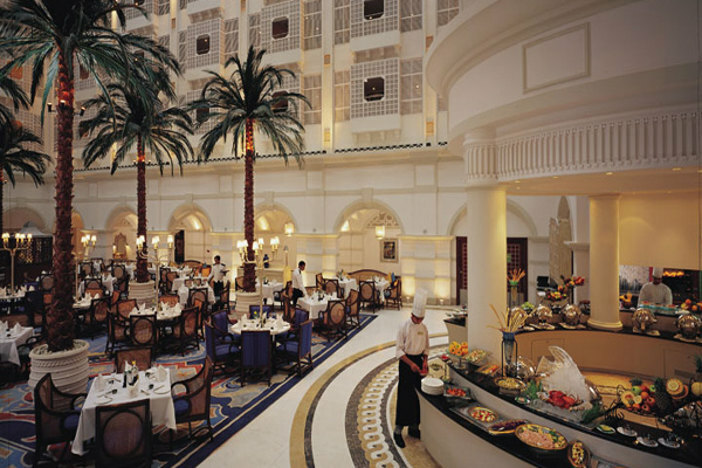 Lunch is at Peshawri – one of ITC Maratha’s wonderful restaurants. India is a subcontinent of multiple, fascinatingly delightful cuisines, each with singular qualities entirely its own. The main three restaurants at this hotel focus on very different styles of cuisine that cross India geographically. Dum Pukht, the ‘fine dining’ restaurant, explores the royal cuisine of Rajasthan and central India, Dakshin Coastal is a seafood restaurant that presents dishes from the southern coastlines and Peshawri allows guests to feast on the meaty delights of the north-western frontier, where India meets Pakistan. The tandoor oven is king in these parts and here at Peshawri the tandoor-roasted kebab takes centre stage. The restaurant is informal, in that it attempts to re-create the atmosphere of northern tradition with low tables and thick, woven carpets hanging from the walls. We are given cotton bibs in dark colours and encouraged to eat with our hands. The kebabs are powerfully aromatic, spicy and thick with fat. Wands of minced chicken and lamb, lamb pieces and mixed vegetable kebabs are accompanied by thick, creamy black daal and flaky, ghee-enriched paratha. This is not the cuisine for the calorie counter, but a joyful way to dine for those who can take the meaty, fiery robustness of the cuisine of the ragged, mountainous north. Mumbai is a city that throbs with the untempered activity of over twenty million people. It is a city that is truly impenetrable to the untrained eye, and with this in mind we take a guide in the form of ITC’s trusty driver, Nixon John. Nixon is one of life’s gentlemen and he provides us with the whistle-stop tour of his overwhelming metropolis. We begin with a hot street-scene at Dhobighat, a unique piece of esoterica that is Mumbai’s open-air laundry market. Laundrymen collect linen across the city and bring it to this huge laundry room where the city’s whites are restored under the blazing sun. We drive on into the greener streets, the quieter district close to Malabar Hill and to Mani Bhavan, the house where Gandhi would stay when in Bombay. The house now exists as a small, discreet museum where you can view the great, peace-loving man’s library and photo exhibitions covering the main events in his life. Set against the extraordinary, wild energy of this city, Mani Bhavan offers a moment’s calm, reflective quiet. Crawford Market is the antithesis of said quiet, close to the centre of the city. This covered food market, where everything edible is for sale, howls with noise and is redolent of spice and aromas of well-hung meat. Children run willy-nilly, crashing into the stalls, each other and any uninitiated reeling tourist. We’re in and out in minutes – the place is too hot and too mad to endure for long. Dinner is at Dum Pukht. We dress carefully, this is a beautiful restaurant where attention to detail is expected to be reciprocated. The restaurant seems to be hewn from pure white alabaster and finished with delicate gold leaf; it is quite clearly a spectacle to be appreciated. Dum Pukht is a brand where reputation precedes. In 2013 the Delhi branch of the restaurant group featured in the San Pellegrino ‘Asia’s 50 Best Restaurants Awards. The menu is focused on the slightly more high toned cuisine of the central north of India, where slow cooking and precise, sophisticated spicing are important. We begin with the most extraordinary kebabs I’ve ever tasted. Lamb meat minced so finely that it could be passed through a muslin cloth. The texture of these kebabs is extraordinary, the closest comparison I could make is to liken them to goose liver, to foie gras. There follows a spiced chicken dish with a lid of puff pastry which might encourage one to call it a pie. Spiced, but sweet with the sour tang of tamarind, it is a delicious, steaming treat, the aromas almost as exciting as the taste. Finally, we feast on lamb shanks that have been cooked for many hours; the meat slips off the bone with the merest hint of help from a spoon. The sauce is thick, dark and very savoury, the fragrant aromatic qualities of the lamb accentuated with cinnamon, cloves and caraway seed. We mop the sauce with more of the flaky, delicious parathas and delight in the feast we have experienced here. From ITC Maratha it is quite a drive south, through the wild, unforgiving streets, to Vivanta by Taj President. Our drive takes us deep into the south of Mumbai, to the elegant Cuffe Parade. Vivanta is the sister property to The Taj Mahal Palace, Mumbai’s venerable flagship hotel which has hosted rockstars and royalty and everything in between since it opened at the dawn of the 20th century. Vivanta is a more accessible brand within Taj hotels’ illustrious portfolio: a luxurious, contemporary hotel for the discerning business or leisure traveller. 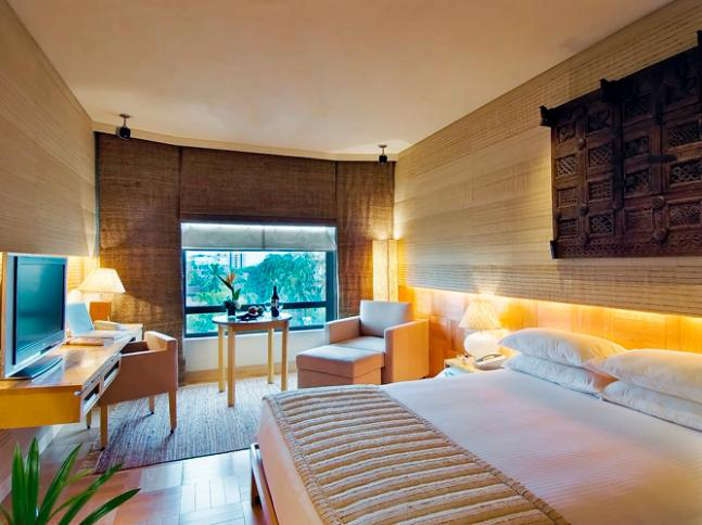 The rooms are extremely smart, without being overbearing and the luxury is contemporary, discreet and well-mannered. 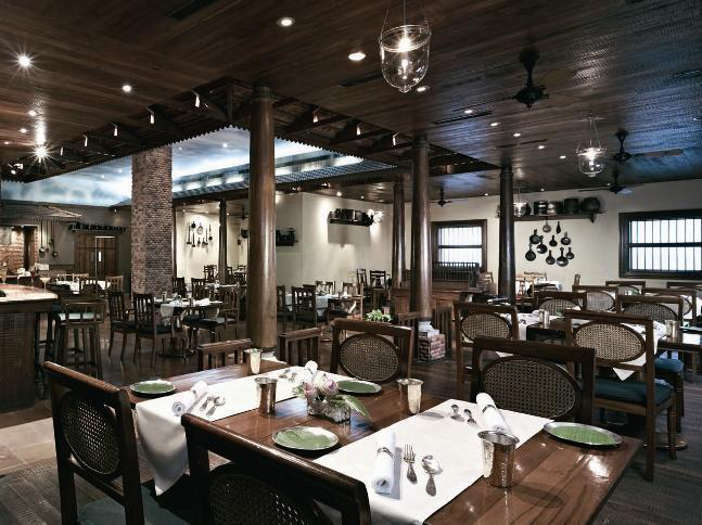 The real draw of Vivanta is its gastronomic offering, in particular The Konkan Café. The Konkan Café offers diners an authentic and comprehensive taste of the coastal cuisine of the region, starting from Mumbai in the north down to Kerala in the far south. This is a land which benefits from an abundance of wonderful seafood along with a broad variety of vegetables and spices that change as you move down the ragged, sprawling coastline of South West India. 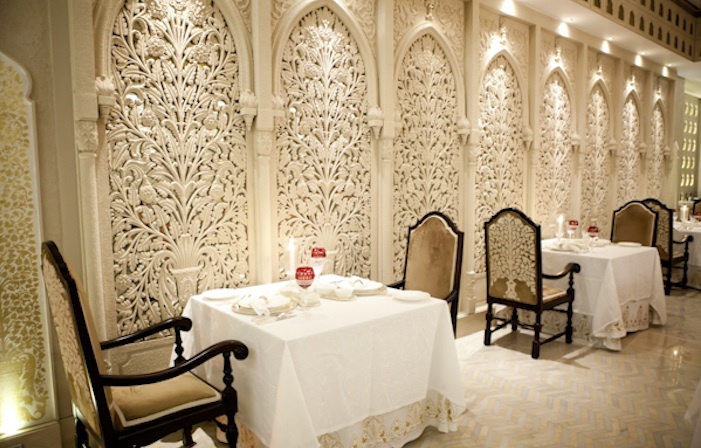 The restaurant, which originally opened to great acclaim in 1998, re-opened last year after a significant makeover. The new restaurant is styled in the manner of a traditional southern Indian home, where entertaining is often carried out in the middle of a courtyard-styled outside verandah. Once seated in the ‘verandah’ we survey the menu at hand. The beauty of the menu here is the fact that the coastline featured covers aver 750km of land, so there is regional variation even within the Konkan area. To begin, we sample a dish of Pomfret, a fish that is celebrated for its subtle flavour and more specifically for its delicate texture. The fish comes roasted from the tandoor over and garnished with curry leaves. The texture is delicate and fine, the meat falls with ease off small bones – it is deliciously tender. The spices are moderate without overwhelming the flavour of the fish. I can see why Pomfret carries such a premium in these parts. Tiger prawns are fried and then served with fresh mango in one of the lightest dishes I’ve enjoyed in India. We progress into heavier territory; in this part of India ‘mutton’ is almost always the meat of the goat, rather than that of an fully grown sheep. This mutton has been slow roasted with cumin, coriander seed and warming cinnamon. The dish comes from the mountainous region of the northern Konkan coast and is worlds away from the cuisine of the hot south, where meat would rarely be seen on a local menu. The meal is a delightful reminder of just how multifaceted Indian cuisine can show itself to be, even when looking at the food of one defined region. It is late now and weariness begins to take hold – we have an early start in the morning. We leave Konkan Café, softened and sleepy, ready for night to take us into its expansive arms. Our room is on the twenty-eighth floor. We stagger in and on impulse open the blinds. Mumbai is a city where night and day mean very little – as many people line the streets at 3am as at 3pm. The city is rumbustious and wild with energy. Our rooms has a wonderful view out over the skyscrapers to the city’s coastline. In the water we can make out ships – liners and cruisers and modest little fishing boats, all moving in the night, all sharing space. This is Mumbai, a city where everybody and everything converges to share space and try to succeed in making it work. ITC Maratha Mumbai Sahar Road, Andheri East, Mumbai, India. Book Now. Vivanta by Taj President, 90 GD Somani Road, Cuffe Parade, Mumbai, India. Book Now. For a visual taste of majestic Mumbai, watch BBC 2’s Hotel India. Episode 2 airs tonight at 8pm.